The high growth economies and growing consumption trend in non-metro cities pushes growth for quality and speed in technology adoption. Digital Printing Demand has been growing quite rapidly in such cities and brings this installation to Allahabad. Allahabad, June 9, 2017: Designed to elevate quality, productivity and consistency, Canon’s first 100ppm colour digital press, imagePRESS C10000VP was installed at Allahabad today. The machine is installed at M/s Classic Printers, renowned printing organization in the city. The production print facility was inaugurated by Mr. Puneet Datta, Director, Canon India. Superior quality, productivity and efficiency of Canon products, have always reaffirmed the customer’s credibility in them. Canon imagePress C10000VP since its launch has been a differentiator in the digital press segment, addressing the evolving demands of the professional printing space. 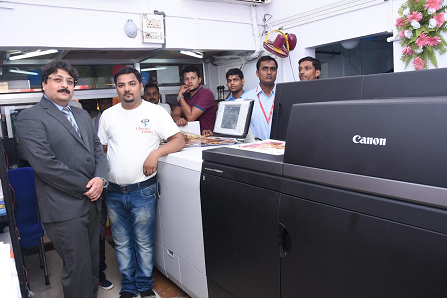 Post installing the Canon imagePRESS C10000VP, customers across the country have witnessed close to 40% rise in their revenues which proves the profitable business model this press brings to the printers. The imagePRESS C10000VP comes with 2400 x 2440 dpi resolution, a choice of new front end controllers based on EFI Fiery FS200 Pro Platform enables the product to streamline the workflow and media handling capabilities from 60 gsm to 350 gsm. Engineered to deliver production printing excellence for the business advantage of its users, it is designed to meet the increasing demand from both commercial and in-house print service providers (PSPs) for higher production volumes without compromising on quality. It can help commercial printers, in-plants, production hubs, direct mail and transaction print service providers to produce a broader range of applications in shorter turnaround times. With its high quality printing, steady colour and efficiency it has garnered major attention in the Indian print market in less than a year’s time, thereby, setting a benchmark in the digital colour printing segment. The imagePRESS C10000VP Series can deliver outstanding customer output while also benefitting from impressive productivity and reliability. It features intuitive operation and can help maximize uptime with automated calibration. As a future ready printer, manufactured to cater to the dynamic needs of the market, imagePRESS C10000VP colour digital press is a landmark product in the Professional Print segment. Canon India Pvt. Ltd., a 100% subsidiary of Canon Singapore Pvt. Ltd., is a world leader in imaging technologies. Set up in 1997, Canon markets over 200 comprehensive range of sophisticated contemporary digital imaging in India. The company today has offices and warehouses in 14 cities across India and employs over 1000 people. Canon has over 500 primary channel partners, 14 National Retail Chain partners, and over 6000 secondary retail points. Canon has 231 own retail stores called the Canon Image Square across 110 cities in the country. Canon India’s service reach extends to over 600 towns covering 16,477 PIN codes across India - which comprises of 300 Camera collection points, 18 camera repair centres, 222 printer repair centres, 262 Sales & Service Dealers. In sync with its corporate tagline- ‘ Delighting You Always’ , reinforced by World class technology, Canon offers an extended product portfolio, including copier MFDs, fax-machines, printers, scanners, All-in-ones, digital cameras, DSLR, Cinematic imaging products, camcorders, cable ID printers and card printers catering to the multiple market segments of consumer, SME, B2B, Government & Commercial. Canon India recorded revenue of INR 2348.6 crores in the year 2016.